At the July 11 Planning & Development Committee, city councillors voted 5-2 in favour of a motion by the mayor to approve an 18-storey highrise across from City Hall at 409 Brant/James (17 storeys plus rooftop patio), plus Section 37 Community Benefits. Committee also supported a motion I brought to direct city staff to work with Kelly’s Bake Shoppe, the Burlington Downtown Business Association and the Burlington Economic Development Corporation to relocate the bake shop in the downtown. The approval heads to City Council Mon. July 16 at 6:30pm. 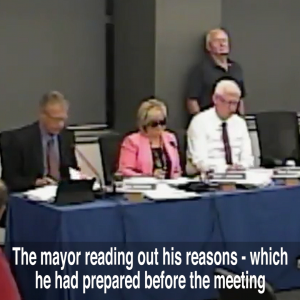 Residents can submit comments on the recommendation to clerks@burlington.ca, or Register as a Delegation (by noon Monday) to speak at Council. reduction in height from 24 storeys, 227 units, to 18 storeys including a rooftop patio, reducing the height of the podium to 3 storeys (from 4), terracing the building away from Brant St. The current Official Plan permission is 4-8 storeys; the new adopted (not approved) Official Plan allows 11 to 17 storeys. increase in proposed retail/commercial space. The developer had proposed reducing the commercial and retail space from 3600 m2 to 597 m2 retail only (no commercial). This represents an 85% decrease in existing commercial/retail space on site, thereby “eroding the retail and employment base of the downtown”, states the staff report. Staff recommend a minimum of 365 m2 of commercial or office space on the second floor and 760 m2 of commercial retail space at grade, for a total of 1,125 retail/commercial (still a reduction of about 70% from what currently exists). increased parking, to 1.25 spaces per unit, versus the developer’s proposal of .93 spaces per unit. increased amenity space to 18 m2 per unit (bylaw requires 20 m2/unit; developer had proposed 3.6m2/unit). 5m by 5m visibility triangle for the intersection of James Street and John Street. 3m by 3m visibility triangle for the south-west and south-east corners of the property. preservation and setback of two buildings with heritage value: Kelly’s Bake Shoppe and Albert Schmid Jewellers. Staff recommend the heritage facades be shifted back on the lot to for widened sidewalks and views into the Elgin Street Promenade. three city trees need to be removed and will be compensated with replanting or cash-in-lieu, where replanting is not feasible, in the amount of $4,100. development can be adequately serviced by storm sewers as a result of dewatering the underground parking garage. Staff also recommend that additional wind mitigation measures should be incorporated at the site plan stage to enhance pedestrian comfort, and additional mitigation on shadow impacts on the public realm. My Take: I voted against the 18 storey approval (along with the Ward 4 councillor), as I believe this represents overdevelopment and forces out local businesses. I brought a motion to reduce the heights to 3 storeys along Brant St., up to 11 storeys along John St. consistent with most of the rest of downtown Brant Street, but that was defeated 6-1. Though the changes from staff improve the proposal, it still represents overdevelopment with not enough benefit for the community to justify the impact of a massive build. There is a major reduction in business space (retail/commercial) thus a reduction in overall employment downtown. The open space at the corner of Brant/James — offered as partial justification for the height — could have been gotten through daylight triangle and parkland dedication rather than accepting cash in lieu of parkland. The wind and shadow impacts are unacceptable (according to the staff report). We don’t need this overdevelopment to meet our growth targets. As noted in the staff report, pg 21 ” The Downtown Urban Growth Centre is well positioned to meet its density targets by 2031″ and further “The Downtown Burlington Mobility Hub has exceeded the minimum density of 10,000 people and jobs associated with a Mobility Hub.”— and will reduce commercial/retail space on a prime downtown street. Regarding the Section 37 Community Benefits negotiated for extra height and density, the assisted housing, heritage preservation and downtown festivals/events are items the community values and has requested over the years. The balance (transit terminal, civic square improvement, active transportation) can and should be funded out of regular operating expenses not through exchanges of height and density. We also have other tools for increased setbacks and public spaces (parkland dedication, daylight triangle) but one of the best ways is to change our zoning bylaw to eliminate development lot line to lot line and build in appropriate setbacks so we don’t need to negotiate for them later.